Will Turner, a Climate Science PhD student, will tell us about his work in "El Nino, droughts, and the transatlantic slave trade"
Professor John Conway will give us a particle physicist's spin on Astronomy in "Inside-out Astronomy"
Davis Science Café is irregularly held at various venues in Davis, most recently the G Street Wunderbar. Spark your mind with a variety of physics topics that span the gamut from high energy particle physics to superconductivity, to the curious geometric structure called the Amplituhedron that challenges the notion that space and time are fundamental components of reality. 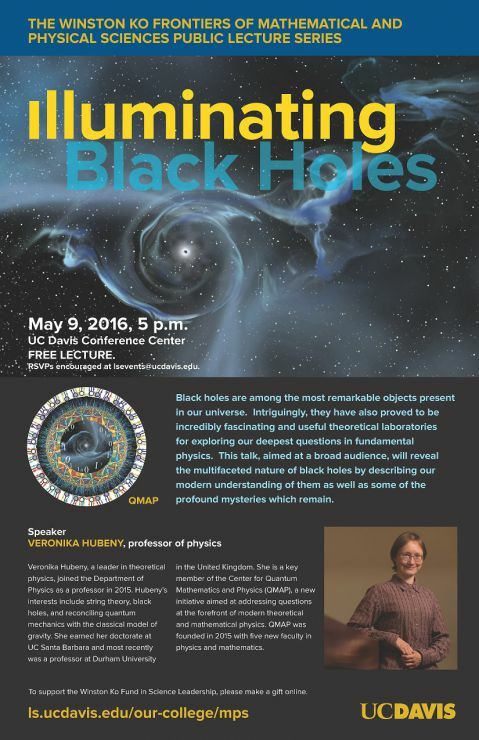 If this captures your attention, these Physics Public Lectures are for you! 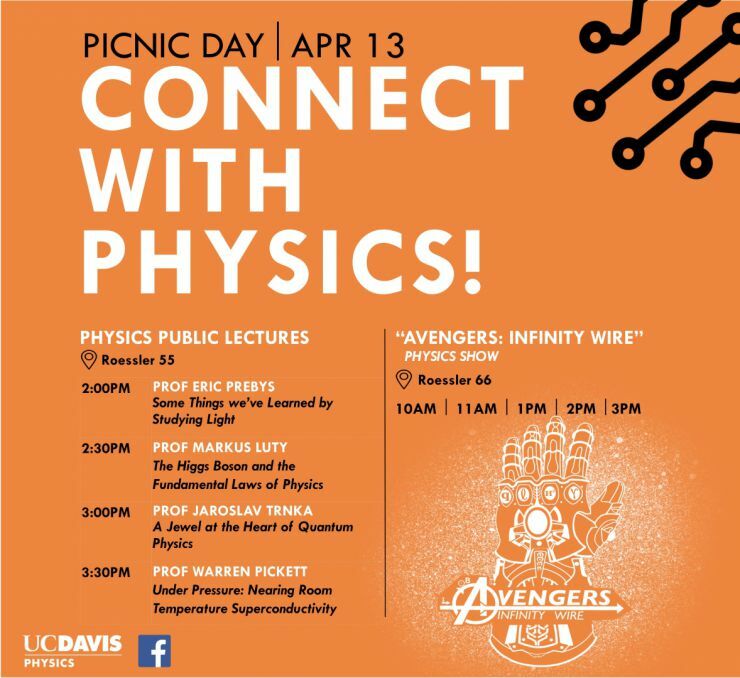 And be sure to see the "Avengers: Infinity Wire" Physics Show in Roessler 66 at 10 AM, 11 AM, 1 PM, 2 PM, and 3PM! Today's disk drives shroud in secrecy a marvelous world of physics. Cutting edge magnetics, plasmonics, materials science, tribology, control algorithms, mechanics, processor design, electronics and software are all needed to make everything work. Disk drives have harnessed all of these areas of physics and engineering since 1956 to provide a rough doubling in capacity every 18 to 36 months. Not even Moore's Law has survived this long! 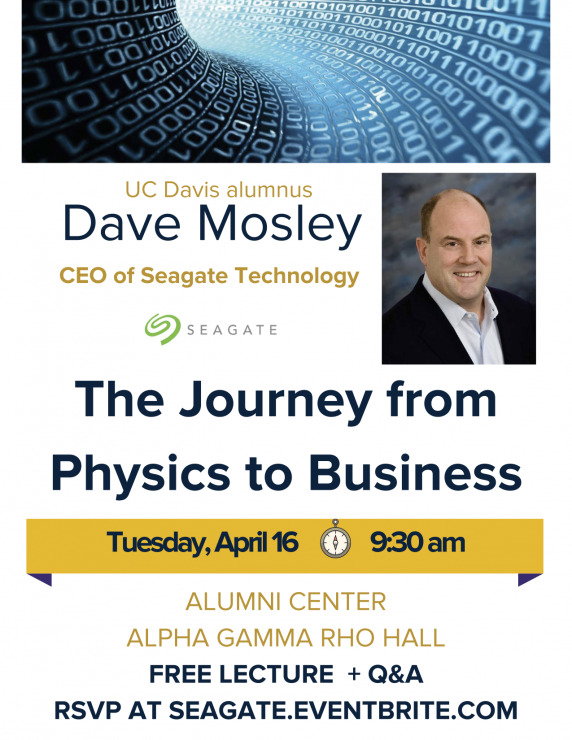 Dave Mosley, a UCD Alumnus, will share some insights about his personal journey from UC Davis to his current role as the CEO of Seagate, the world's largest data storage company. In conjunction with the Association of Pacific Rim Universities Multi-hazards Hub at Tohoku University in Sendai, Japan, this workshop will explore current and future applications of new techniques in data science to the field of multi-hazard research and practice. Click here for more. The 30th annual Conference on Computational Physics (CCP2018) will take place July 29 - August 2, 2018 at the University of California, Davis, campus in Davis, California, USA. 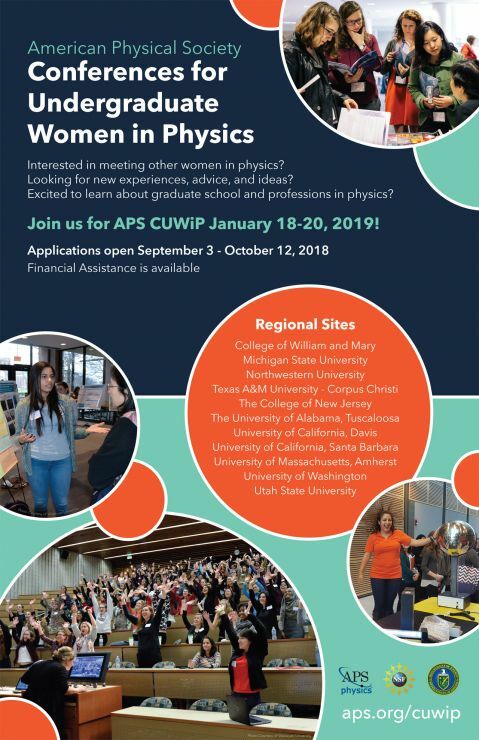 CCP is a series of conferences held annually under the auspices of the International Union of Pure and Applied Physics (IUPAP) on the basis of endorsement by its Commission on Computational Physics (C20). The purpose of the conference series is to bring together computational scientists working in physics and closely related areas to exchange the latest developments in computational techniques and their applications. The conference features plenary, invited and contributed talks as well as poster presentations in a wide number of subject areas of active interest to the computational physics community. The 9th International Conference on Highly Frustrated Magnetism 2018 (HFM 2018) will be held at the University of California, Davis campus, in Davis, California from the 9th to the 14th of July, 2018. It will also serve as a satellite to the International conference on Magnetism ICM 2018 (July 15 to July 20) in San Francisco, California, allowing participants to coordinate travel to both meetings (if they wish). This international conference will be a great opportunity for scientists from around the world to share the most recent developments in the study of frustrated magnetism. It will feature presentations reporting on experimental and theoretical studies of magnetic frustration, in all of its manifestations. This conference follows in the series of HFM 2016 (Taipei, Taiwan), HFM 2014 (Cambridge, UK), HFM 2012 (Hamilton, Canada), HFM 2010 (Baltimore, USA), HFM 2008 (Braunschweig, Germany), HFM 2006 (Osaka, Japan), HFM 2003 (Grenoble, France) and HFM 2000 (Waterloo, Canada). Superconductors are fascinating quantum materials with applications that include the lossless transmission of electrical power, levitating trains, making huge magnetic fields, and detecting the tiniest magnetic fields. Conventional superconductors were discovered in 1911 but the theoretical explanation did not come until 1957. High temperature superconductivity, discovered in 1986, is unconventional and we still don't have a theory that explains it. There are dozens of other types of unconventional superconductors that we cannot explain. In my lecture, I will explore superconductivity and the bizarre behaviors of some quantum materials, and show some of the transformative applications. I will explain in simple terms what we do know, and give a perspective on how much we still have to learn. Superconductivity reminds me of the universe itself: we use it every day, it's very useful, and mostly, we don't know very much about it! The annual conference Amplitudes 2018 will be hosted by SLAC on June 18-22, 2018 and will bring together experts in this area discussing recent discoveries. The conference will be preceded by this present summer school, and it will offer a set of introductory lectures to some of the key topics to be discussed at the conference. The summer school will be held at the Center for Quantum Mathematics and Physics (QMAP) at the University of California, Davis on June 11-15, 2018. Please see the QMAP Website for more information here. Laura Greene, Outgoing President, American Physical Society, will spend two days at UC Davis in May, hosted by the Physics Department. 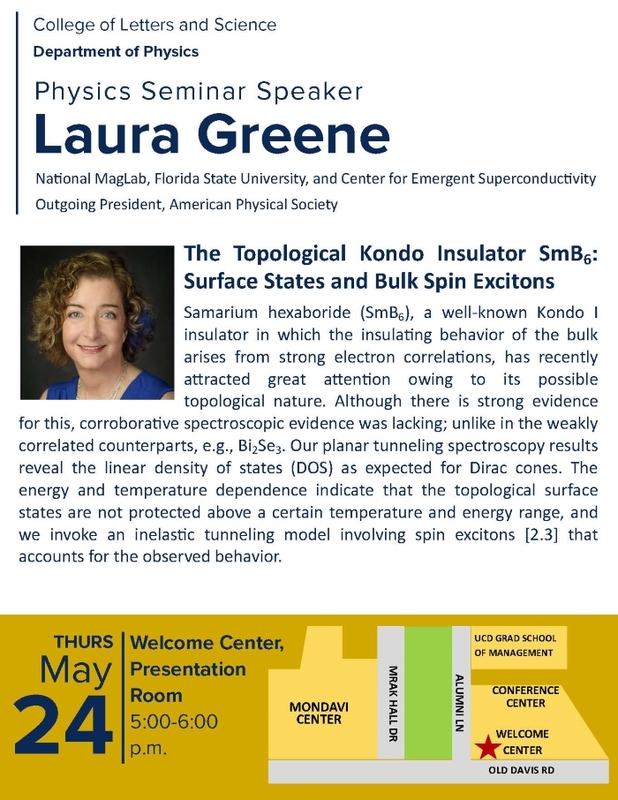 Dr. Greene will give a public lecture on Wednesday, May 23rd, at the health campus in Sacramento, and a more detailed physics seminar on Thursday, May 24th at the Welcome Center on the Davis campus. Both events are free and open seating. The UC Davis College of Letters and Science is inviting alumni and friends to add their support on Give Day, April 20, 2018. As part of the Give Day effort, QMAP has set a goal to reach $10,000 in donations that will be used to support vibrant high-level scientific activity, including an active visitor program, workshops, and conferences. It will also be used to recruit and recognize stellar students and postdoctoral researchers, helping QMAP attain further international renown, becoming a destination of world experts in the field. Ten gifts to QMAP on Give Day will unlock a $10,000 donation. Give Day starts at Noon on April 20 and ends at 5pm on April 21. 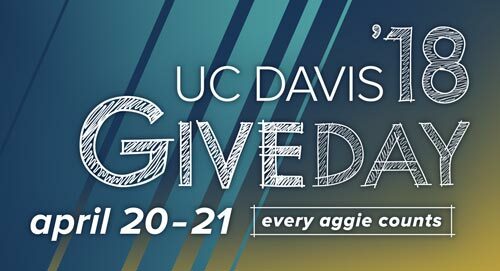 Share your support of UC Davis on social media with the hashtags #UCDavisGiveDay and #EveryAggieCounts. A room filled with demos showing cooling physics and some applications to modern technology. Informal and staffed by volunteers. 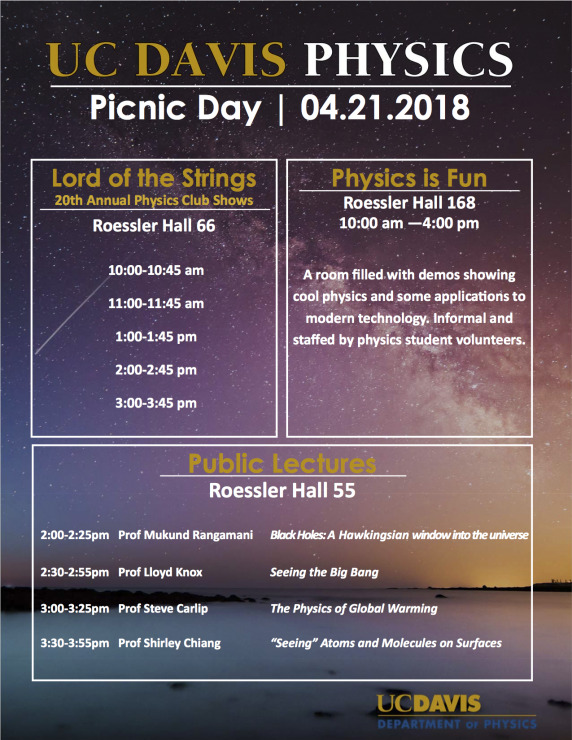 Watch the 2015 Picnic Day Physics Club show below! The meeting will be held on the 4th floor of the Department of Physics in the seminar room. The focus is on recent topic in scattering amplitudes, in particular mathematical aspects of positive Grassmannian and Amplituhedron, non-planar on-shell diagrams, ratio functions in N=4 SYM, symbols and the basis of hexagon functions, CHY formula, BCJ relations for effective field theories. The schedule is very flexible and it might change on the short notice. There will be thematic sessions with one (or more) introductory talks also for more general audience. Tuesday, June 8, 3:30pm: Lance Dixon on Hexagon bootstrap. Also, Sebastian Franco will give a string seminar on Thursday at 3:10pm. 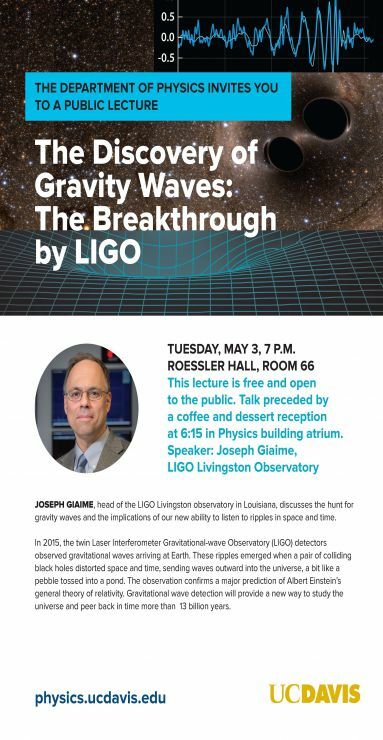 Physics Department public lecture with Joesph Giaime on May 3 at 7pm in 66 Roessler Hall. 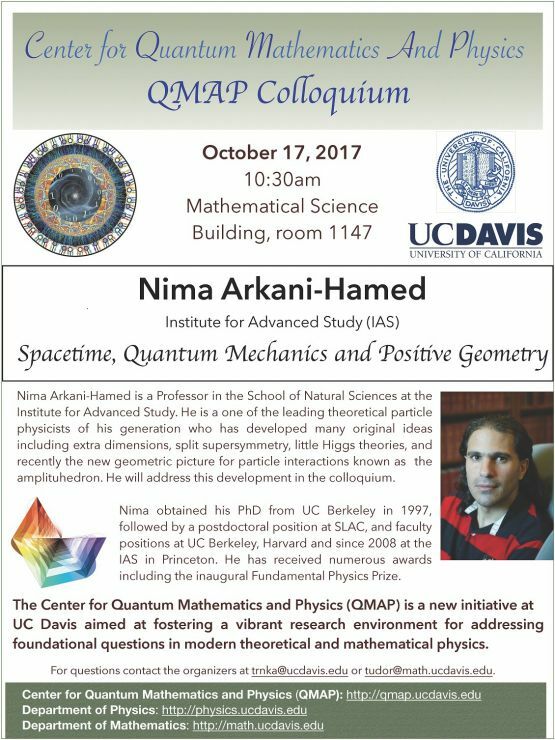 Join the Math and Physics departments for a welcome reception this Thursday 5-7:30 in the physics atrium (see announcement here http://qmap.physics.ucdavis.edu/#!./events.md) This event will include posters, brief comments from our new faculty and especially a chance to mingle and talk informally. Undergrads (physics majors or not) and friends of the physics department are especially welcome. Feel free to spread the word to anyone you think might be interested. A room filled with demos showing cool physics and some applications to modern technology. Informal and staffed by volunteers. Some of our more spectacular demonstrations with entertaining explanations. Presented by Physics Club volunteers. 2:40 - 3:20 Assoc. Prof. Michael Mulhearn: Measuring ultra-high energy cosmic rays using your cell phone! 3/11/2015: The Dark Side of the Universe, a conversation with Prof. Marusa Bradac. A room of demos, many hands-on, showing cool physics and some applications to modern technology. Informal and staffed by volunteers. 3 repeat performances, 12;10, 1:00, 1:50, featuring some of our more spectacular, but less hands-on, though always edifying, demonstrations. Staffed by Physics Club Volunteers. 3/28/2014: A public lecture, "The Large Hadron Collider: The Big Bang Machine" by Prof. Dr. Albert DeRoeck, a senior research scientist for CERN and adjunct professor of physics at UC Davis, will be held in the Welcome Center Presentation Room at 8pm. Tickets are available for $7 at the UC Davis Box Office. Any remaining tickets will be sold at the door prior to the lecture. These lectures sell out quick, get your ticket now! 3/20/2014: Brian Greene, physicist and Pulitzer Prize finalist, will be at the Mondavi Center as part of the Distinguished Speaker series on March 20 at 8pm. 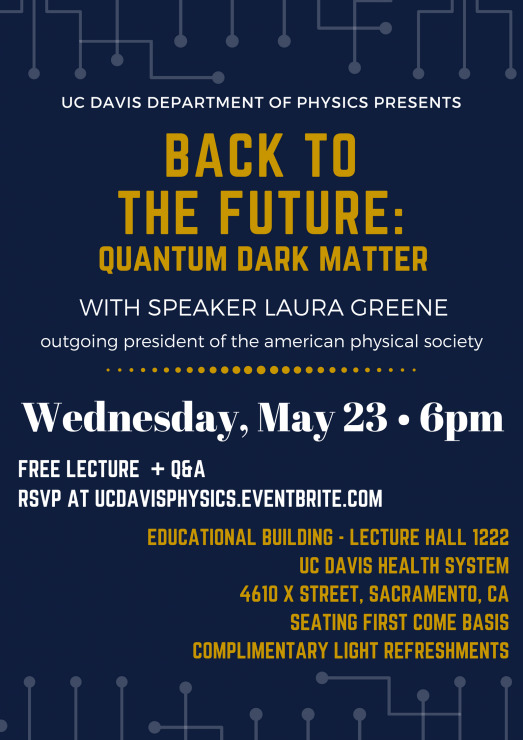 The event is done in partnership with the UC Davis Physics Department. 10/5/2013: A public lecture, "Can we observe dark matter in the laboratory," by Prof. Michael Witherell will be held in room 1100 Social Siciences on October 5, from 5 to 6:30. 9/5/2013: A special seminar with Nobel Prize winning physicist Gerardus ‘t Hooft will held in room 185 Physics on September 5 at 1pm. “The Borderline between Classical and Quantum Mechanics". 5/22/2013: Sean Carroll will speak at the UC Davis Conference Center. Sean is a very entertaining and compelling public speaker and the author of two books, "From Eternity to Here: The Quest for the Ultimate Theory of Time" and "The Particle at the End of the Universe: How the Hunt for the Higgs Boson Leads Us to the Edge of a New World." He will speak about "The Origin of the Universe and the Arrow of Time." Although free, due to high demand, a ticket will be needed for admission. For more information, including how to obtain tickets, please see this link. 4/20/2013: The Lander Lab was dedicated as part of our annual Picnic Day Alumni Reception. View photos here. 4/6/2013: A day of exciting public lectures from four prominent physicists including Nobel Prize winner Frank Wilczek. April 6 is Decision Day. Plan for extra traffic near the campus. 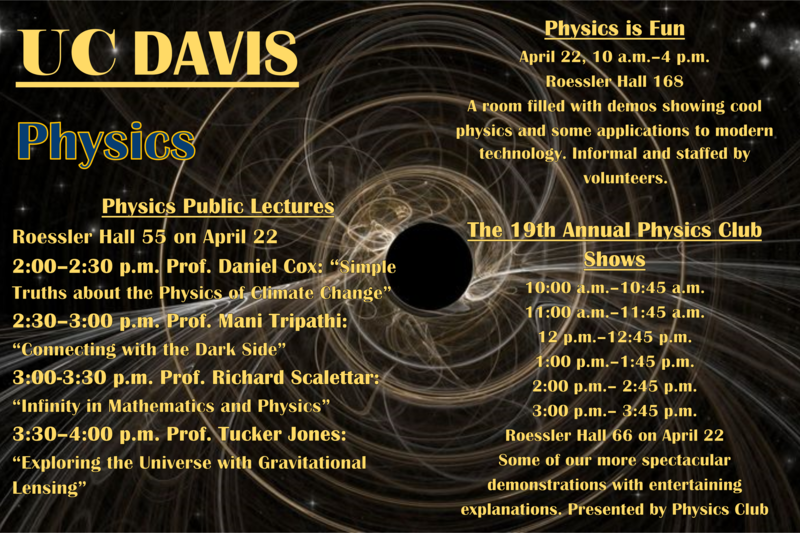 4/17/2012: Professor Lisa Randall, particle physicist and popular author, will speak at UC Davis on April 17. Physics makes the world go ‘round! Come experience cool physics demos,and learn how modern technologies are applications of basic physics. Nobel Prize winning physicist Martin Perl and his son The New Republic's art critic Jed Perl discuss the creative process in the sciences and the arts. 3/8-3/9/2012: The 1st UCD – Nanjing University Workshop on Condensed Matter Physics will be held during March 8-9 in 185 Physics. The event is open to public. In particular, Physics professors Knox and Zimanyi fascinated listeners with Physics-related stories and fantasy-meets-reality tales of space and nanoparticles, respectively. Founded in 1984, TED is a nonprofit organization that combines Technology, entertainment and design, and offers fascinating speakers willing to share their ideas via visually broadcast talks, available at http://www.ted.com. TEDxDavis is an independently organized event scheduled to occur on the UC Davis campus. The April 23rd Davis event theme is: "Think Big. Think Small. Think Forward." Several speakers from alternating fields, including Physics professors Lloyd Knox and Gergely Zimanyi have been chosen to speak at this event. 1:30 Bob Svoboda - Do We Live in a Universe of WIMPs? Physics makes the world go 'round! Come experience cool physics demos, and learn how modern technologies are applications of basic physics.